Within the Jefferson National Forest between mileposts 196.2 and 197.8, 218.5 and 219.4, and 219.8 and 220.8 until permission is granted by the U.S. Department of Agriculture Forest Service and the U.S. Department of the Interior (USDOI) Bureau of Land Management. This approval must be documented in a filing with FERC. Within the boundaries of the Blue Ridge Parkway Historic District between mileposts 246.1 and 246.6 until permission is granted by the USDOI National Park Service and documented in a filing with FERC. Within the boundaries of the North Fork Valley Rural Historic District between mileposts 226.3 and 228.3 and the Bent Mountain Rural Historic District between about mileposts 242.0 and 246.6 until the Virginia Department of Historic Resources comments on the Treatment Plans filed Feb. 2 and 14, 2018, and Mountain Valley documents the completion of fieldwork by filing a Management Summary. Through skips along the pipeline route between mileposts 219.7 and 219.8, 223.9 and 226.1, 228.3 and 228.7, 234.1 and 234.2, 235.1 and 235.4, 238.1 and 242.0, 248.4 and 249.8, 253.7 and 253.9, 254.7 and 254.9, 257.9 and 258.0, and 258.1 and 258.4. 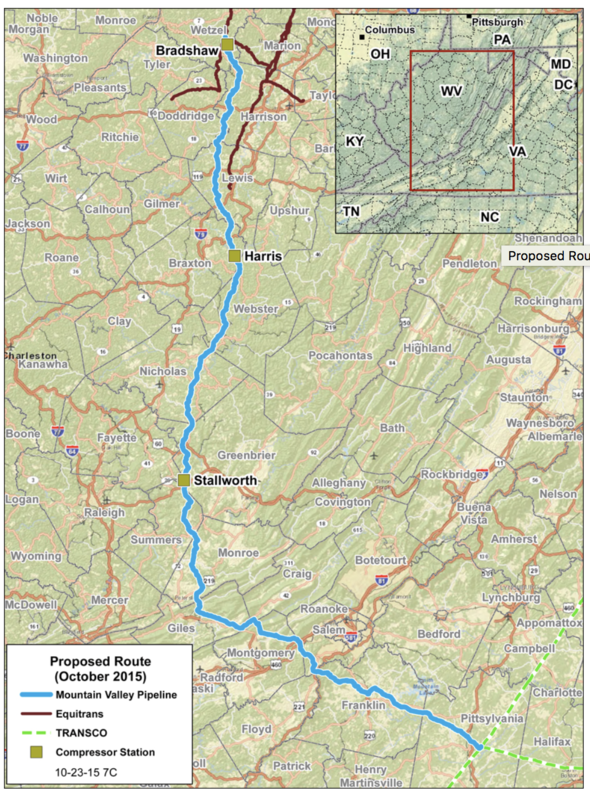 The Mountain Valley Pipeline will span approximately 303 miles from northwestern West Virginia to southern Virginia. It will be constructed and owned by Mountain Valley Pipeline LLC, which is a joint venture of EQT Midstream Partners LP; NextEra US Gas Assets LLC; Con Edison Transmission Inc.; WGL Midstream; and RGC Midstream LLC. EQT Midstream Partners will operate the pipeline and own a significant interest in the joint venture. With a vast supply of natural gas from Marcellus and Utica shale production, once completed, the Mountain Valley Pipeline is expected to provide up to 2 MMDth/d of firm transmission capacity to markets in the Mid- and South Atlantic regions of the U.S. The MVP will extend the Equitrans transmission system in Wetzel County, West Virginia, to Transcontinental Gas Pipeline Co.’s (Transco) Zone 5 compressor station 165 in Pittsylvania County, Virginia.